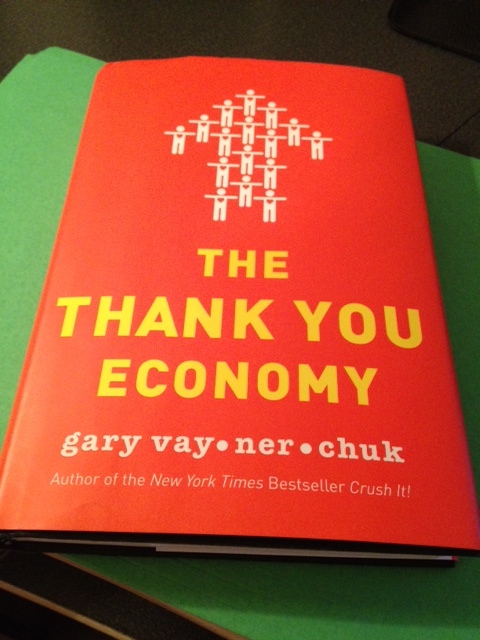 In his book,”The Thank You Economy,” Social Media Champion and Wine Library entrepreneur Gary Vaynerchuk makes the case for engaging customers through authentic conversations in social media. I just finished it and it is a fairly quick read. Some of the book’s key points might be considered “no-brainers” to seasoned marketing/public relations and social media pro’s. However, some professional business people still fail to see the benefits of the two way conversation that the new economy provides. Vaynerchuk calls Chapter Three “Why Smart People Dismiss Social Media, and Why They Shouldn’t.” He outlines 11 excuses company’s use for not taking part in social networking. Do you see anyone you know in any of these excuses? 1- There’s no ROI– Gary argues that because word of mouth is so strong all companies should be thrilled at this opportunity to gain advocates. 3. Social media is still too young– “The longer you hesitate the more you will struggle,” says Gary who compares diving into social networking with his 11th hour decision to gain friends in high school senior year. He says the students who started out making friends freshman year were more popular and had more invested. 4. Social media is just another trend that will pass– As Gary points out that’s what they said about radio, TV and oh, yes the internet too! 5. We need to control our message– As he points out companies rarely sink under the weight of one Facebook post. Ongoing customer service is the key. 6. I don’t have time to keep track of what every Joe or Jane says, and I can’t afford /don’t want to pay someone else to do it. Gary says do not dismiss any customer or what he/she says because the power now rests with them. 7. We’re doing fine without it. Really? How do you know? 8. We tried it; it doesn’t work. As Gary says, social media is a long-term commitment and requires patience, commitment and strategy. Do you know people who still dismiss social media without seeing it as a valued communications strategy? Or do the business people you know see it as an ideal way to communicate and thank their customers for their business? 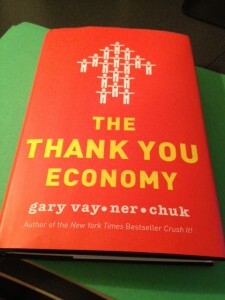 As a side note Gary Vaynerchuck is scheduled to speak in Greeneville, Tenn. in June. If I’m in town, I will definitely be there! « What are your Favorite Presentation Tips? Thanks for sharing this info, Mary Ellen. Sounds like a book I definitely want to check out. I’ve must admit I didn’t “get” social media for a long time–it seemed like a colossal waste of time, but as I’ve looked at it more strategically and watched the impact of social media increase, I’ve definitely seen the positive impact it can have on a business. And the bottom line is that as things change, we need to change with the times (and the technology). Linda, there probably isn’t much you don’t already know but Gary V. writes it in an easy to digest style. I’d love the details about Gary being in Greeneville – I’d drive over for that one. He makes good points about social media. To me it’s all in the philosophy of one’s business. If you’re a traditional big-sized male oriented culture you probably will struggle to “get” social media. But that sure doesn’t mean you can’t benefit. Yes Sue Gary certainly is colorful. I already have my ticket just not sure if I’ll be in town that day. Great article Mary Ellen. I see a lot of business owners on both ends of the spectrum: from “social media is a big waste of time”, to “social media is going to make me a millionaire.” I think the truth is really somewhere in the middle. As long as you have a clear strategy, social media can be a great way to engage your clients, build relationships, and ultimately build your business. Linda – I just had the amazing opportunity to hear Gary Vaynerchuk speak live at Infusioncon – He was passionate, fired up, inspiring, honest, raw, and brilliant. His keynote was the highlight of the conference for many and it’s easy to see why! I bought the book there, and am looking forward to a sunny weekend day to dive in poolside! Transforming Businesses into Extraordinary Brands with Websites That Work When You’re Not Working. I bet he was great Jennifer!